My sister-in-law is expecting a baby this summer and I started having flashbacks to those exciting days of creating a baby registry. I remember entering Babies R Us and feeling extremely overwhelmed. I thought my husband and I would just kind of “learn as we go” but looking back, it would have been MUCH more helpful to have some real recommendations and insight. The reality is that you really don’t need THAT much when your newborn comes home. You’ll definitely need to stock up on diapers and easy-on/off onesies. You’ll need a car seat to get home. But other than that, your little bundle won’t require much more those first couple of weeks. 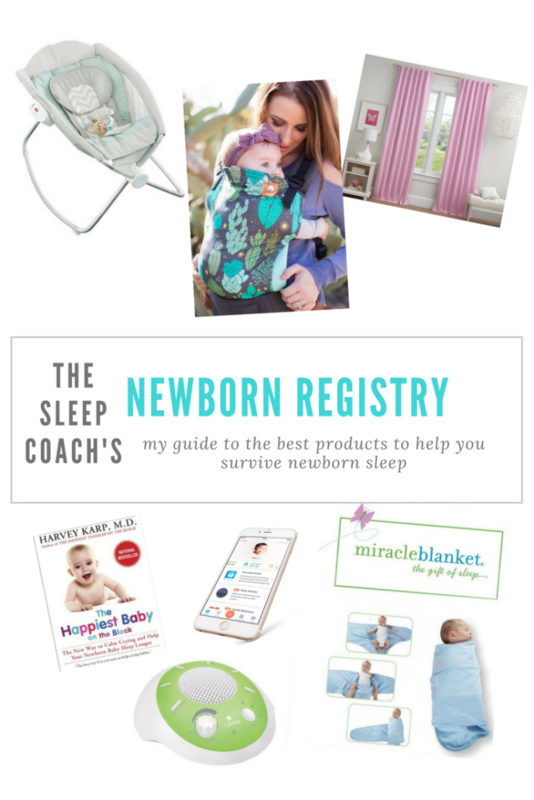 These are a few items that proved really helpful with my two daughters and I’ve seen great success with as a sleep consultant. Fisher-Price Rock n Play. I love this little bassinet, although many parents have a “love-hate” relationship with it. If your baby loves this sleeper, it will cradle them for hours, giving you much need rest. Some babies love it a little too much and can be difficult to transition out of. However, this product is really just meant for the newborn period (birth to 4 months), and for that time period you are in sleep survival mode. The Rock n Play is so popular because it’s a cozy, inclined bassinet that can easily be moved around the house. The newest version even has an automatic rocking mode! Most newborns are uncomfortable with the big, open spaces in a crib, so the confinement of the Rock n Play soothes them. The incline is also great for babies who struggle with reflux. A great baby carrier. The one pictured here is the Tula carrier. You’ll want to shop around for the best baby carrier. Some require special inserts for newborns and others can be really difficult to put on with a floppy, crying newborn. My personal favorites are the Tula, Boba, and Ergo. Your newborn will be very sleepy and very portable. Take advantage of the snuggles and wear them around during the day. This is also a great way for mom to get out of thehouse and socialize. Blackout Curtains. You’ll want to invest in really good blackout curtains for baby’s room. This is so important because you will want to help your baby understand that dark times are for sleeping and light times are awake periods. As a newborn, they will be able to sleep through lots of stimuli, however as they get older they will need a very dark, cave-like environment. The less light peeking through in the early morning hours means less early wakings too! Unfortunately, I’ve found that the cheaper blackout curtains just don’t work as well as the more expensive materials. My personal favorite blackout curtains are Pottery Barn Kids. They’re not cheap but they’re excellent at blocking out light. The Happiest Baby on the Block (DVD). The book is pretty much my newborn sleep bible; however, I often recommend the DVD version to expectant parents. The book is a great resource; however, the DVD is excellent at really demonstrating proper soothing techniques, plus you can’t beat Dr. Harvey Karp’s soothing voice. He really lets you feel at ease when you’re dealing with a fussy newborn. Sound machine. A sound machine that plays continuous white noise is a must-have. Many parents make the mistake of buying a machine that automatically shuts off after 30 minutes or play sounds like ocean waves or a babbling stream. You want your sound machine to run for the duration of the sleep period and play just white noise. Why? White noise is comparable to the constant loud, shushing noise babies hear in the womb. I personally love the one I purchased off Amazon for a mere $25. There are more expensive options that people love, but the cheaper versions provide the same effect. A baby feeding/sleeping App. How awesome is it that we can track our newborn’s feeding and sleeping on an app?! This is great for breastfeeding moms who lose track of what side they last fed baby on, great for bottle-fed babies so mom or dad can keep track of the ounces consumed, and most importantly make sure baby doesn’t become overtired by watching the clock. Newborns can only handle a period of 45 mins-1 hour of awake time. By keeping track of your baby’s sleep and awake times, you can alleviate fussiness from being overtired. The miracle blanket. I’m a swaddle-lover. Newborns have an innate reflex called the Moro Reflex, where they frequently flail their arms. These flailing arms lead to disrupted sleep and comfort; hence the need to swaddle them up tight, just like they were in the womb. For the first couple of weeks, you can swaddle baby easily in those large, stretchy muslin blankets. As they get older, they become stronger and start stretching their arms and legs more as they sleep. This is when many of them start resembling escape artists, with one arm out smacking themselves in the face, or a blanket that has scooted its way up near baby’s face (yikes!). The Miracle Blanket was created to combat this problem of the little Houdini’s. It takes some time to get used to the process of putting baby’s feet in the pouch, and wrapping the long pieces of fabric around the arms and tummy. However, once you master the method, your little one will certainly sleep longer stretches. Sleep consultant gift certificate. What better way to say “congratulations” than giving the gift of sleep! 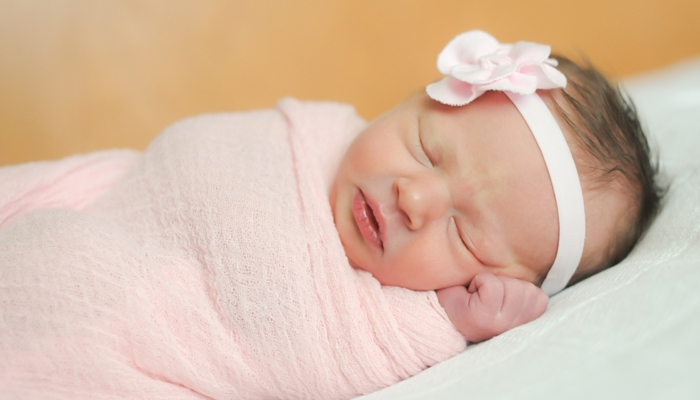 A sleep consultant educates expectant parents about what to realistically expect during the newborn period. A certified sleep consultant will be knowledgeable about milestones, regressions, schedules, sleep environments, and more! The most common response from my clients is “I wish I had done this sooner!” The reality is that you don’t need a lot of fancy sleeping gadgets; getting a professional coach on board is THE best investment. If you need more help navigating the newborn period, check out my Expectant Parent/Newborn Consultations. « Troubleshooting Naps: What Would the Sleep Coach Do?